Corporate partnerships happen every day. Many are in “name only” while others combine the strengths of the partners to create something totally new and different. 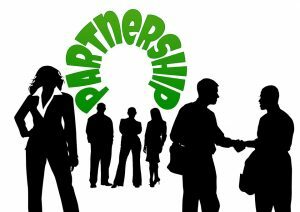 Some of these partnerships are very successful, while others require more effort than the value they generate. In a Sales Partnership, the sales and marketing departments from both companies work together to presumably grow business for both businesses. An example of an ideal fit is if two companies are essentially selling different things to the same customers. A caution, a lot depends on the character and makeup of the companies involved. It seems like far too often the larger, billion-dollar company is unwilling to share its customers with the smaller company, instead wanting to only acquire from the other smaller partner. These partnerships are very valuable for only one company and can be harmful for the other. They are doomed to failure. Effective partnerships require mutuality and buy-in across both companies. This includes on-going upper management involvement from both parties, with a commitment to the success of and by both organizations. At AnswerOn, we are committed to this success by involving all aspects of our company including Project Management, Sales/Marketing, Engineering and, importantly, Executive sponsorship. Each of the two parties must see a benefit and the value of working the relationship. How each company sells its product is also relevant. AnswerOn sells its products and services in the CRM vertical by a strong, provable ROI. Ideally our partners complement this ROI, or vice versa. By combining AnswerOn’s attrition reducing software with, for example, a work force management product, you have the opportunity to customize each company’s product to maximize success. Our products require a minimum of IT involvement and live in the cloud, in an ASP model. By adopting this approach to our products and partners, we remain agile and scalable. If you are looking for a partner who will give maximum effort while expecting the same, please fill out the form below to contact our Sales Team.